Abstract: The Neogene Carpathian arc is a complex magmatic arc, extending from Slovakia into Romania. The Transcarpathian region in SW Ukraine comprises the central part of this arc and was active in the Middle-Late Miocene. The volcanic structures of the Transcarpathian region can be divided into three major areas: a—Outer Arc; b—Intermediate zone; c—Inner Arc. This division reflects the basic tectonic features of the Ukrainian Carpathians, but differs from other parts of the Carpathian arc. The Outer Arc consists of a number of overlapping stratovolcanic structures, generally composed of lava flows, domes, dykes/sills, volcanic necks and lahars of basaltic andesite, andesite and dacite composition. In the Inner Arc, tuffs, ignimbrites and ash deposits of dacite, rhyodacite and rhyolite are abundant. Lava flows of andesitic and basaltic-andesitic composition are present, together with domes of dacite and rhyolite. The Intermediate zone is composed of lava domes and small andesitic shield volcanoes. New K/Ar data obtained from 57 volcanic rock samples has yielded K/Ar ages of 13.4–9.1 Ma. This time interval (~4.5 million years) is similar to that of the neighbouring Carpathian volcanic regions to the west (Tokaj Mts., Hungary) and to the east (Călimani, Romania). Badenian rhyolitic tuffs buried within the Transcarpathian area represented the earlier phases of magmatism, but they have been dated only by biostratigraphic methods. Thus, there is no evidence in this area for any along-arc migration of volcanism, unlike in the Eastern Carpathians of Romania. Formation of volcanic structures started simultaneously in both Outer Arc and Inner Arc volcanic areas (13.4 Ma). Different peaks of volcanic activity were observed: (a) between 13.0–11.5 in the Inner Arc, interpreted as the major period of generation of a complex of resurgent domes related to formation of a caldera, probably situated toward the central part of the Transcarpathian depression, and (b) between 11.2–10.5 Ma in the Outer Arc, representing the main period of volcano generation. The end of the volcanic activity (9.5–9.1 Ma) was scattered and less voluminous. Abstract: Excellently preserved, pyritized radiolarian skeletons have been found within the Upper Cenomanian deposits in the Pieniny Klippen Belt (PKB—Carpathians, Poland). On the basis of a study of their chemical composition, structure of replacing skeletons and exceptional preservation of all morphological details, we propose a new model where the pyritization process took place not in sediment but while the radiolarian skeletons were suspended in the anoxic water column. The radiolarians rich in organic matter, sinking through the upper (iron-rich) part of an anoxic water column, became the sites of organic matter decomposition and enhanced bacterial sulphate reduction. Dissolved iron in this zone diffused into the radiolarians and precipitated as iron sulphides replacing the opaline skeletons. This process was controlled by the rates of opal dissolution and of bacterial sulphate reduction, and the availability of dissolved iron. The preservation of radiolarians in the Upper Cenomanian deposits from different depth sub-basins of the PKB was compared. We found that the extent of pyritization and preservation of radiolarian skeletons may be dependent on the depth of the basin and the position of the oxic-anoxic interface. Abstract: A new roveacrinid microcrinoid, Roveacrinus berthoui nov. sp., is described from the Lower Hauterivian marly limestones at Busot (Alicante, SE Spain). It represents the first record of this family from pre-Albian strata, and as such, constitutes a major stratigraphic and taxonomic advance in our knowledge of this unusual fossil crinoid group. Abstract: In the more shallow-water Czertezic Succession, the stratigraphical interval of maximum deepening of the Pieniny sedimentary basin in the Upper Jurassic is not represented by typical radiolarite sequences with radiolarians, representing middle Callovian–early Oxfordian to late Oxfordian–early Kimmeridgian (U.A.Zone 8–U.A.Zone 10), as we can observe in the deep-water Kysuca Succession, but by radiolarian limestones with radiolarian cherts and irregular layers of radiolarites. Their sedimentation began here only in the Oxfordian. The radiolarian microfauna is of middle-late Oxfordian to late Oxfordian–early Kimmeridgian age (U.A.Z.9–U.A.Z.10). In four sections in the locality Litmanova fifty-eight taxons and one new species Archaeospongoprunum mizutanii Ozvoldova, n.sp. were identified in the assemblages. The high content of spumellarians (70–80 %) could reflect the paleogeographical and paleoceanographical conditions of sedimentation. 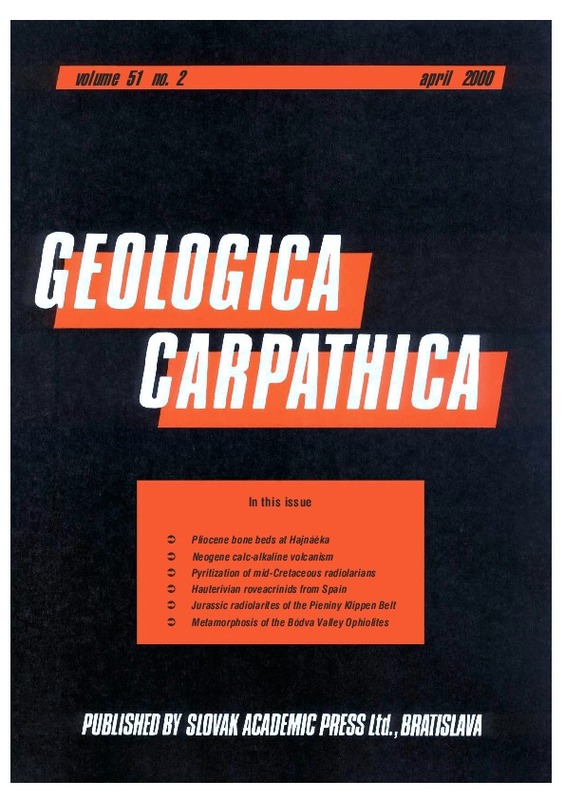 Abstract: The Alpine polyphase metamorphic evolution path of the Bódva Valley Ophiolite Complex was reconstructed using mineral paragenetic observations, mineral chemical and thermobarometric data obtained on metagabbroic samples from boreholes in the Rudabanya Mts., NE Hungary. The dismembered ophiolite complex forms part of the Meliata Unit of the Inner Western Carpathians. The recognizable, first blueschist facies event (min. 700–800 MPa, 350–500 °C) was followed by a nearly isothermal decompression to 400–600 MPa in the greenschist facies. The following metamorphic event was characterized by temperature increase up to 500–600 °C in isobaric conditions to the albite-epidote-amphibolite facies. The P-T path is best explained by subduction, which was followed by uplift without any significant change in the temperature conditions. The late temperature increase might be caused by thermal relaxation following subduction.